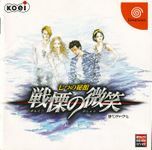 The title means "The house of seven mysteries – The Smile of shivering". A Biohazard (Resident Evil) clone game. The door to a world of darkness, opened by the hands of two. An organisation enshrouded in mystery. A hidden mad plan. Each riddle leads to another. Two players simultaneously control one main character each. At times they walk together solving the riddles, at times they have to venture alone, hoping for the other's survival. The game depends on the communication between the two!